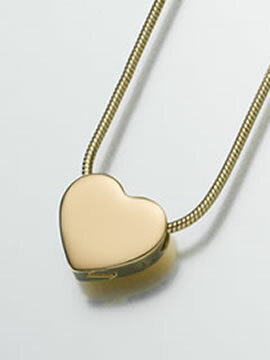 The Heart Slide Keepsake Urn is available in Sterling Silver or Gold Vermeil. The vermeil heart is plated with 100 milligrams of gold, the best grade of plating available. A screw opening allows a way for a very small amount of cremains, dried flower petals, or other remembrance to be added. Filling instructions, a small funnel, and care card are included with each pendant which is presented in a black velvet gift box. This beautiful pendant measures 5/8"H x 5/8"W x 3/16"D.